Hundreds of new apps hit the Android and iOS app stores every week. We’ve sorted through them to pick the best medical apps for medical professionals. And check out our Best Medical Apps of 2018 … So Far. The Indextra Android application gives users access to over 500 medical texts and guides on- and offline. Publishing partners are Cambridge University Press, Elsevier, Royal Pharmaceutical Society, Wiley, and WHO. All clinical specialties are covered and guaranteed to be up-to-date. The keyword search function instantly searches all titles, diseases, and symptoms for relevant information. Current titles within the library include the Complete Oxford Medical Handbook series, Wiley’s Rapid series, Wiley’s At a Glance series, and ICD-10. After a free 30-day trial, users are charged $24.99 per month for ongoing access. Manual of Nursing Diagnosis is the Android app version of the 13th edition of the reference text of the same name. The free download contains approximately 10% of the content, and full content can be purchased by tapping on any locked topic. This guide is designed for nurses and students creating care plans for patients in a variety of settings and care levels. It contains all nursing diagnoses created and reviewed by NANDA International. Guides for critical care, community, and families are included, as are plans for infants, children, and adults. This edition has over 20 new nursing diagnoses, like previously retired diagnoses. Care plan options are categorized by patient patterns and include: nutritional-metabolic, elimination, sleep-rest, sexuality-reproductive, coping-stress, and value-belief patterns. 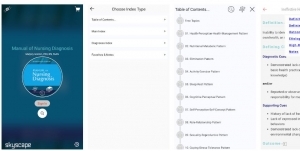 Within the app, nurses can choose to index the content as sectioned by the authors or by diagnoses. Each nursing diagnoses is broken down in the same fashion: definition, defining characteristics, outcomes, and etiological factors. Users can view favorites, save history, and take notes within the app.